* Mike Sterling makes his monthly list of things that are more important to the Direct Market than James Turner comics. * Neilalien talks about his stunning 10 years of comics blogging. Eep! It's a compelling post and must-reading for anyone that makes use of a blogging platform in their interaction with comics. 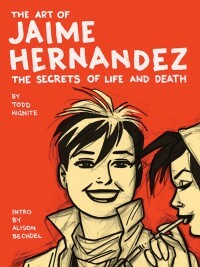 * Tim Hodler offers up a few initial notes on The Art Of Jaime Hernandez: The Secrets Of Life And Death. A pretty rigid but enlightening fight breaks out in the comments thread on the idea of cropping art for an "Art Of" book, and whether or not this can at times represent an art director's intrusion into the work itself. I think all approaches are valid and can be judged on the result and according to our personal preferences without making from-the-mountain-top proclamations over what's good and what's bad. It does strike me there's a point of which you have to wrangle with the book in front of you as opposed to the book you think should be in front of you. * the writer Sean T. Collins has as clever follow-up on the recent naming of five DC executives into new positions with a look at public outreach via twitter. * Diana Tamblyn has a write up of Seth's appearance at the Dominion art show in London, Ontario for a conversation with curator Andrew Hunter. * I'm not sure this is worth the exclusivity hype as I'm not aware of any burning competition for publishers at industry meetings of this type, but it's worth noting that Image is sending Robert Kirkman to speak at the forthcoming ComicsPRO meeting in Memphis. * finally, the great Sam Henderson walks us through a German edition of MAD.